Five volumes of “Windows to the Past: Burials in the Western District of Lawrence County, Arkansas 1835-2000” have recently become available from Arkansas Research, Inc, in Conway. Compiled by Thomas J. Helms of Starkville, Miss., and co-authored by Catherine S. Richey of Powhatan, these books contain information about more than 10,000 individuals who are buried in the 78 cemeteries located in the western district of Lawrence County. “It is a great source of information for those researching their Lawrence County families,” Richey said. Arranged in alphabetical order, the entries include cemetery where buried, dates of birth and death, parents, siblings, marriage, military service and in some instances, where they were living when Census takers came around. This information is taken from many sources of records in Lawrence County, as well as personal visits to the cemeteries. Each book contains a complete index of burials, indicating which book the person is in. Volume I is the Black Rock and Powhatan area, Volume Western Lawrence Co. burials recorded Catherine S. Richey of Powhatan (left) and Thomas J. Helms of Starkville, Miss., inspect the recently published books “Windows to the Past: Burials in the Western District of Lawrence County, Arkansas.” II is the Imboden, Ravenden and Annieville area, Volume III is the Smithville, Denton and Annieville area, Volume IV is the Eaton and Lynn area and Volume V is the Jesup, Saffell and Strawberry area. The index can be previewed at www.ArkansasResearch.com and the books can be ordered from this site or at P.O. Box 303, Conway, AR 72033. 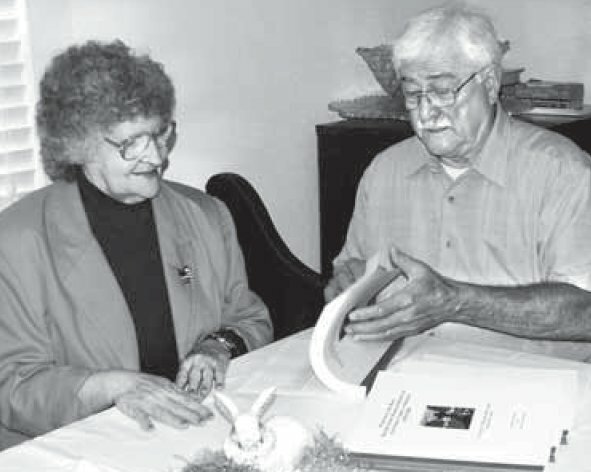 Both authors have selfpublished earlier books of Lawrence County records, including “Military Service and Civil Records of Confederate and Union Soldiers, Lawrence County, Arkansas,” “Marriages, Vol I, II and III, 1824- 1920,” “Census records from 1830 thru 1910,” “New Hope Baptist Church Records, 1844-1920” and “Johnson Funeral Home Records” that have gone to people across the United States who are working on their family histories. Those needing more information can contact Richey at 870-878-6863 or 870-878-1619. She, however, does not have copies of the new books. They must be ordered through Arkansas Research, Inc.